Approximate birthday for 9" workshop? Just picked up a nice little South Bend. I'm the second owner - the original owner passed away last month, got it from the widow. Aside from being covered in oil and grime, it looks near new. I'd conservatively rate the original at over 80%. Scraping still visible, better than 60% over the ways. No nicks or dings or drop marks. 3.5' bed. Set up as a C model. Odd thing is, it does not have the control lever I am used to. It has three push-buttons mounted onto the left spindle-guard - integral to the casting. "Rev" "Stop" and "Fwd". Anyone ever seen that before? Or is it really common and I've just never noticed before? Are the 3 pushbuttons used to control the motor or to control the lead screw? If they control the motor, its possible someone has replaced the drum switch with a pair of relay contactors buried in the base somewhere. The button would control the coils of those relays. If the pushbuttons somehow move the reversing gears between the spindle and lead screw, then someone else who has a lot more knowledge of the SB product line will have to explain it. I have one of the back gear guards for the three button switch but I have never been able to find a switch or have I ever seen this setup in an SB catalog and I do have a lot of them. Jeff Beck from Tools4cheap had one a year or so ago. I have always figured that this switch was used with the single phase instant reversing motor that SB offered. If I remember right the one Jeff had did not have any contactors and the switch controlled the motor directly. I may be wrong in this but I think that is what I remember. It would make more sense that the three buttons controlled a forward reveres contactor as you say mounted down in the bowls of the machine somewhere. I would love to see a picture of the back side of the switch and also the switch plate. I only have the box on the guard. Here is a picture of what one of the switch housing looks like. ok, here are a couple snapshots. The lathe is still partially-disassembed and is bolted to the delivery pallet. I'd mocked it up for the photos, but the cover isn't bolted on in the pics. I can't run it right now, for obvious reasons, so no idea how the switch works, exactly. I will post pics of the hookup afterward when I clean the lathe up. The outlet plug goes into the housing and a second wire runs to the motor, so I doubt any electrics are buried in the body of the lathe. The motor looks original. There is a data-plate on it, but it's just a part number from what I can see. No specs - though I haven't looked it over thoroughly yet. Might-be an instant reverse model - not sure. Either way, it's neat to find something unusual like this. The lathe is destined to be converted to an A model as I have all the necessary parts either in-hand, or on the way in the mail. According to Leblond/South Bend my lathe shipped from the factory on March 7, 1941. It was sold through A.R. Williams Machinery Company Ltd. to Viking Pump's Toronto facility, which I think is where the guy I got it from worked at one time. There is VERY LITTLE signs of use on this machine, almost no wear at all. scraping still plainly visible (see the photos). Nearly all the shavings I found were brass - doesn't look like it saw much steel. I can only imagine this thing was used to cut the odd custom brass fittings for the pumps they were selling? 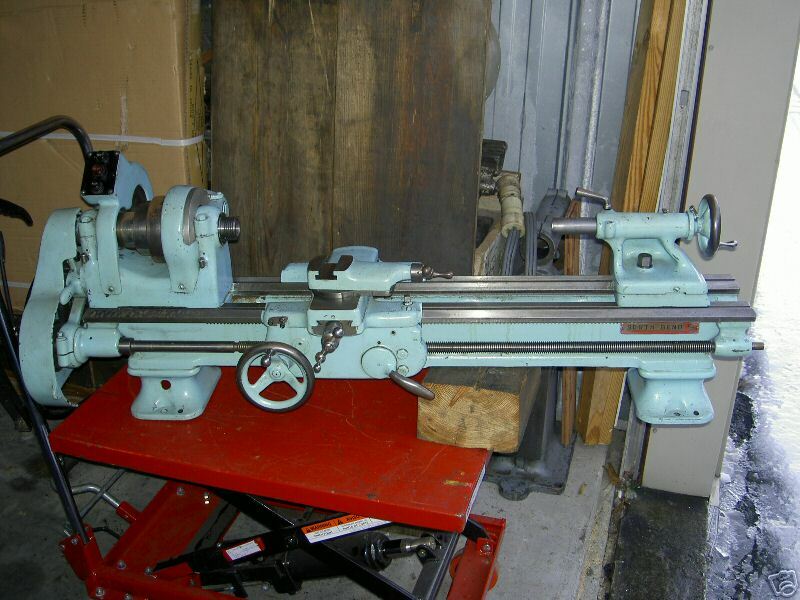 By the wayu, how narrow a bench can I get away with when mounting this lathe? 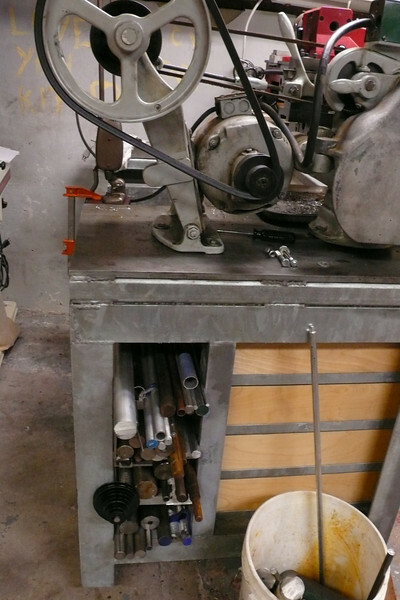 I have to weld up a new steel bench frame for this machine and don;t want to go too small. From roughly mocking it up, it looks like I can get away with a bench 27" deep and not have the flywheel hitting the wall I'm backing it against - does this sound right? I plan to use the hole footprint from the US ARMY manual floating round the net, though that might only apply to the 10K - do they have the same footprint as the 9" workshop? Check of SBL Bulletin 645B (S Wells has a copy on his web site). It shows the wiring for a few drum switches as well and the 3 pushbutton control. This bulletin shows a pair of contactors which are driven by the 3 buttons and are used on 3-phase motors. Its possible someone replaced the original 3-phase motor with a different style, single phase motor and adapted the pushbuttons to run it directly. Do the push buttons lock when you press in FWD or REV, and pop out when you press STOP, or are they all momentary (spring loaded)? If they are momentary, I think you need a relay contactor to run the motor. For and Rev lock, one or the other, and stop makes both pop out. The motor is single phase and, I think, original. I talked to the widow I bought it from last night - Her husband ordered it through work in 1941 and he was the first and only owner (making me No.2). The only thing that looks replaced is the power cords. 111760, 9" x ? bed Workshop Model C, Has rare cast switch housing in left gear cover. Stamped J.A.N. Mine is also a J.A.N. marked lathe, but is an earlier serial number and retains SB paint. I think you need to go deeper, but I only have experience with one lathe. 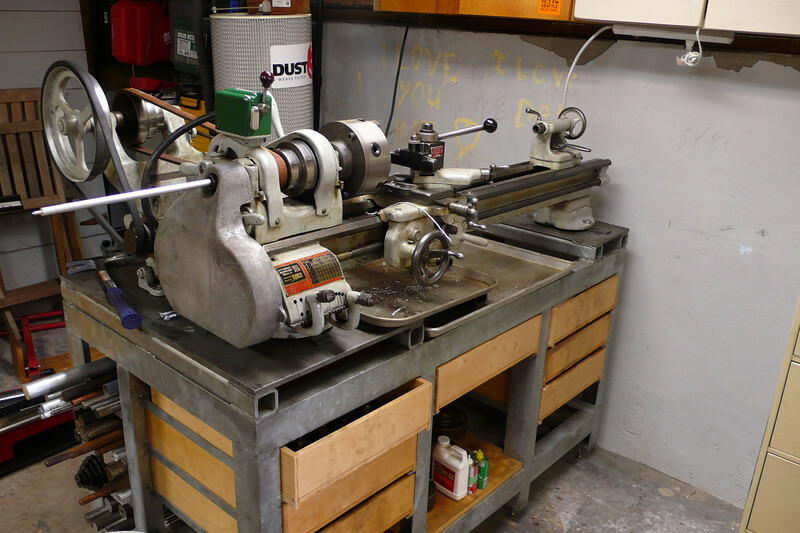 My lathe came with a 30" deep workbench and the flywheel would hit the wall if I had it setup along a wall. Nice looking bench! Is that a 9" SB? It looks bigger somehow... I also plan to have mine mounted closer to the front of the banch than you have done. Here are the dimensions from the 1939 catalogue. From the diagram, it looks like I could go with anything over 26.5" - no? It is a 9A with a 4 1/2' bed. That is a foot longer bed than normal and the bench also helps make it look massive. The bench is really great. It has a lot of storage for tooling and stock and is very stout. You could do 26.5", but your lathe would be right on the front edge of the bench. You'd probably end up with some oil on the floor from cutting operations instead of in a chip tray. I like being able to put my chuck key down under the quick change gearbox too. I don't think you'd gain any functional space. If you are building a bench and want the floorspace back then I'd make the bench top be larger (up to the full 33" if you are mounting against a wall) and you could have the legs set back a couple of inches from the front of the bench.